Announced at the annual HOUSES Awards, Domenic Alvaro received two high commendation awards for his multi-award winning project Small House, located in Surry Hills, Sydney, Australia. Presented with accolades across both the New House under 200 square metres and the Outdoor category (in collaboration with 360°Landscape Architects), Small House has become a ‘living’ exemplar of urban consolidation. Proposing to build upwards rather than outwards by assigning multiple uses to single spaces, Small House reflects a contemporary lifestyle full of diversity and creativity; all for the cost of a city apartment. “In collaboration with 360° Landscape Architects, we were able to achieve a phenomenal ‘working’ roof garden terrace. 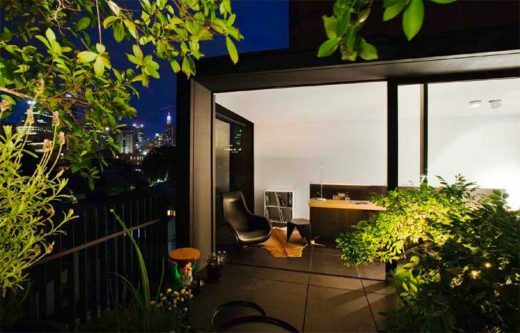 The circulation space enabled a small study on the roof space, allowing the roof to become the 5th room of the house – albeit an outdoor room, herb and flower garden with an over-scaled fig tree; creating a canopy effect,” said Domenic Alvaro Principal, Woods Bagot. Adding to the urban fabric of the inner-city, Small House not only details exceptional architectural and interiors, and landscape features, yet presents a solution to the long-standing issue of urban sprawl. Key to the landscape design was to create a surprising, verdant, immersive space that spoke to both an urban sanctuary and a working kitchen garden. “The rooftop garden is a place of respite that has a sense of wildness, yet complements the quiet rigour of the architecture. Reducing the urban heat island effect, the space provides a habitat for birds and insects; in this highdensity context, the garden’s visual amenity benefits neighbours and the streetscape as much as it does the owners,” said Daniel Baffsky, Principal, 360°Landscape Architects. Earmarked in the NSW Department of Planning’s ‘draft good design for medium density living,’ Small House is a living example of the direction of the government, to locate a greater proportion of new homes in existing urban areas with the majority being located within walking distance of existing centres, that enjoy good transport and accessibility. “Sydney’s urban landscape needs an injection of innovation as the city looks to more efficient use of urban areas to accommodate population growth,” continued Domenic. Presented by Houses magazine, the Houses Awards is an annual program celebrating Australia’s best residential projects. In celebration of Australia’s finest architecture, Domenic Alvaro was recently presented with two architectural awards – Residential Architecture (Houses) and Small Project Architecture, for his Small House project at the recent NSW Australian Institute of Architects (AIA) Awards. 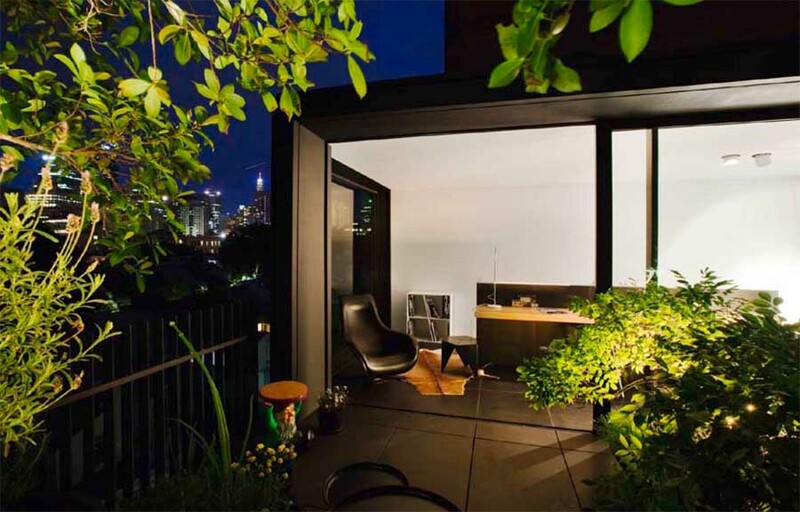 Adding to the urban fabric of inner-city Surry Hills, Sydney, Small House not only details exceptional architectural and interiors features, yet presents a solution to the long-standing issue of urban sprawl. Reflected in the AIA’s Jury citations Small House exemplifies a clever solution for inner-city housing, using contemporary materials and methods; moving beyond limited quasi-traditional outcomes. “Small house investigates a new typology in the current urban living space, whilst still reflecting a contemporary lifestyle full of diversity and creativity; all for the cost of a city apartment,” said Domenic Alvaro, Principal, Woods Bagot. As an exercise in urban consolidation, the philosophy of small house proposes to build upwards rather than outwards by assigning multiple uses to single spaces, with flexibility for change in the future. The site is so small it can fit into the garage of your typical sprawling suburban home (7mx6m). Earmarked in the NSW Department of Planning’s ‘draft good design for medium density living,’ Small House is a living example of the direction of the government, to locate a greater proportion of new homes in existing urban areas with the majority being located within walking distance of existing centres, that enjoy good transport and accessibility. “Sydney’s urban landscape needs an injection of innovation as the city looks to more efficient use of urban areas to accommodate population growth,” continued Domenic. Held annually, the AIA Awards are the most prestigious in the design and construction industry, and have had a significant influence on trends in architectural design. Domenic Alvaro is considered to be a distinctive voice in Australian Architecture. He is an architect who insists on the uniqueness of architectural experience for each project and upon the importance of architecture in its particular place. He leads design at Woods Bagot Sydney drawing upon the realisation of many varying scaled projects, including the Ivy Development for visionary Hotelier Justin Hemmes which was the recipient of the Lloyd Reece Medal in 2010. One of the world’s leading architectural practices, Woods Bagot has a global team of more than 700 working across North America, Europe, Asia, Australia and the Middle East. The firm’s unique “One Global Studio” philosophy drives unprecedented knowledge sharing and true collaboration across time zones, producing innovative, inspired and functional design solutions for our clients. Underpinning Woods Bagot’s knowledge culture is PUBLIC, our propriety research brand, created in collaboration with leading thinkers and academics. The firm’s diverse portfolio of high-profile projects includes: Adelaide Convention Centre, City Central Precinct, Hilton Hotel (Adelaide), Hilton South Wharf (Melbourne), Eccleston Square Hotel (London), and St Regis Beach Resort (Abu Dhabi), and Shijiazhuang Exhibition and Convention Centre (China).